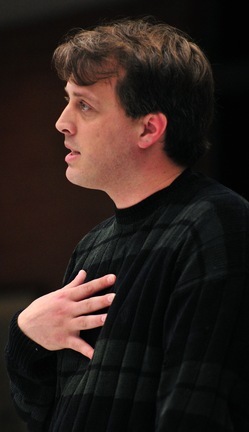 Posted on Tue, Mar 6, 2012 : 5:58 a.m.
Ann Arbor City Council Member Stephen Kunselman, D-3rd Ward, came out opposed to the four-party transit agreement at Monday night's meeting. He cited concerns about empty AATA buses running out to Chelsea and Canton from Ann Arbor. The Ann Arbor City Council voted 7-4 early Tuesday morning to approve a four-party agreement that lays the framework for creation of a new countywide transit authority. The decision came toward the end of a six-hour meeting, the majority of which was spent discussing the agreement with the Ann Arbor Transportation Authority. It now awaits approval from the other two parties: Washtenaw County and the city of Ypsilanti. Council Member Tony Derezinski, D-2nd Ward, called the council's approval of the agreement the launch of "something very big." "Of all the regional needs there are in this area, transportation is perhaps the most compelling right now and the hottest," he said. "We have to address this now." The four council members who came out against the agreement were Mike Anglin, Marcia Higgins, Stephen Kunselman and Jane Lumm. They said they aren't opposed to expanding transit services — they just have concerns about the path the city is headed down. "I do think this is much more than a framework, lest we forget notwithstanding anything in this agreement to the contrary," Lumm said, mocking the legalese of the document. 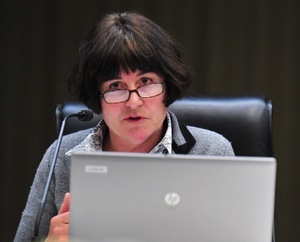 Council Member Jane Lumm had this to say Monday night: "Ann Arbor has had a strong, dedicated transit system that taxpayers have funded and the city has controlled for decades, and now our community is being asked to fundamentally change that structure." "It's an extremely important question for our community," she added. "Ann Arbor has had a strong, dedicated transit system that taxpayers have funded and the city has controlled for decades, and now our community is being asked to fundamentally change that structure." AATA officials have been working for the last few years to develop a comprehensive plan for expanding transit services throughout Washtenaw County and have held dozens of public meetings to seek input. The plan, which appears to have support in the community, is to create a new countywide transit authority later this year that will replace the AATA. A financial task force formed by the AATA issued a report last week that concluded the countywide plan could be funded with a 0.5-mill countywide property tax. No final decision has been made about going to voters with such a millage request. But if it does turn out to be the way to go, the idea is that the new countywide tax would be layered on top of the transit millages Ann Arbor and Ypsilanti voters currently pay. Mayor John Hieftje and other council members pointed out that by approving the agreement this morning, the City Council has made no final commitments. The city still could opt out in the coming months and essentially halt the countywide expansion, and voters will have the final say before any countywide authority becomes operational and funded. Council Member Sabra Briere, D-1st Ward, brought forward an amendment to the four-party agreement Monday night that won unanimous support from council. It built on an amendment the council made to the agreement several weeks ago, now making it mandatory that if a majority of city voters fail to approve a funding source by Dec. 31, 2014, then the countywide transit authority is a no go — even if approved by a majority of county voters. While Briere won support for her amendment, Lumm and Kunselman had no luck convincing council to go along with changes they proposed Monday night. Kunselman, D-3rd Ward, proposed increasing Ann Arbor's representation on the countywide transit authority board from seven to eight members. That would give the city a majority on what's expected to be a 15-member board, but the amendment was defeated 8-3 with Kunselman gaining support from only Lumm and Anglin. 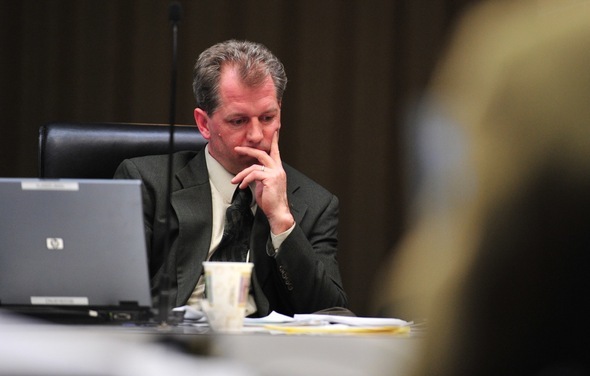 Other council members expressed concerns the amendments Kunselman and Lumm proposed showed a lack of trust in the process and went too far in trying to exert Ann Arbor's dominance, which could send the wrong message to other partnering jurisdictions. Lumm brought forward three amendments of her own — all of which were defeated. She tried to add clarifying language to provide assurances to Ann Arbor taxpayers that there could be no reduction in current AATA services under a new authority. That amendment was defeated 6-5 with only Anglin, Briere, Kunselman and Higgins joining in support. Lumm also tried making it so at least 50 percent of the municipalities in Washtenaw County — or 14 total jurisdictions — would have to participate in order for a countywide transit authority to become operational. That amendment was defeated 7-4 with only Anglin, Kunselman and Higgins joining in support. Another amendment was defeated 8-3 with Lumm getting support from only Anglin and Kunselman. It would have given the parties the right to modify or terminate the four-party agreement if state legislation to create a regional transit authority for Southeast Michigan was approved before a new countywide transit authority became operational. Briere said that particular amendment felt like requesting a prenuptial agreement "when you don't trust the other party." She said she had faith in the process and the parties involved. Lumm later expressed regret there wasn't more of an appetite on council for, in her words, tightening up the agreement and providing more protections for city taxpayers. Before voting against the four-party agreement, Anglin expressed concerns he might be supporting Fuller Road Station by voting for the agreement, because the proposed transit center project is included in the contemplated five-year program. AATA officials stressed the five-year program is still being finalized and won't be released until April or May, and even if the project is included, that doesn't preclude the council from taking a future vote on it. The council welcomed state Rep. Jeff Irwin, D-Ann Arbor, to the podium Monday night to talk about pending transportation legislation in the state Legislature. That includes legislation calling for creation of a regional transit authority for Southeast Michigan. "I would urge you not to let that uncertainty stop you from moving forward," Irwin said. "I certainly don't think any of the bills, if they were to pass or not pass, would replace this process here locally or would supplant what you're trying to do here locally." Irwin said the bills most closely related to the AATA countywide expansion are probably the regional transit authority bills. State Rep. Jeff Irwin encouraged Ann Arbor officials to move forward with the countywide transit plan instead of waiting on the outcome of pending state legislation. "Those bills seek to create a regional transit authority that would cover Wayne, Oakland Macomb and Washtenaw counties," he said. "I think the best way to think about that authority in the broadest sense is that it's an overlay authority, and what the governor has proposed is that there'd be a four-county authority created that would govern services that cross jurisdictions." Irwin cautioned that many of the transportation ideas being discussed in Lansing, including an RTA for Southeast Michigan, have been around for many years. He said he's not sure it's wise for city officials to hang their hopes on any of the bills making it through the legislative process, particularly the bills that deal with coming up with local revenue. "This has been an issue where local governments have been asking Lansing for decades, longer than I've been around, to unhook the shackles," he said. "And Lansing has repeatedly said no, and they've taken away our revenue sharing dollars just on top of that. "I would really encourage you to use this process here locally as an opportunity to seize our own destiny locally," he added. "If we want more transit service, if we want later routes, if we want more regional service, if we want service that draws our county together, we have to solve that here locally. We can't wait for folks up in Lansing or folks in Washington, D.C."
Kunselman argued the AATA hasn't proven itself to be an efficient regional service provider. He said AATA is sending buses right now to both Canton and Chelsea in the morning, primarily empty, picking up commuters, and driving them back to Ann Arbor. And then at the end of the day, he said, those buses are picking up commuters in Ann Arbor and driving them back out to Chelsea and to Canton, and then driving back to Ann Arbor empty. "Does that make sense? It doesn't make sense to me," he said. "They propose to expand that kind of service where we send empty buses out to municipalities." Kunselman expressed concerns there would be empty buses running to not only Chelsea and Canton, but also Dexter, Saline, Milan, Manchester, Whitmore Lake, Livonia and Plymouth. "It'll be the Ann Arbor tax dollars that are subsidizing those," he said. "Remember, $100,000 is going toward the effort of subsidizing commuter services for Canton and Chelsea right now, so that's the issue that we're dealing with under this proposed Act 196 agreement." Hieftje argued there's broad public support for expanding transit services in underserved areas of the county and that'll help bring people to work in Ann Arbor and reduce the need for more parking. He said both environmentalists and business leaders support the plan. Wed, Mar 7, 2012 : 12:03 a.m.
Tue, Mar 6, 2012 : 10:51 p.m. I would like to say I am the person that makes $8.00 hour. Let me tell you something if you think I am selfish in not helping my fellow man. I pay very high taxes to live in Ann Arbor, we have no garbage pick up(we pay for it) I have a well and drain field that I pay for when it goes out or needs to be empted. We live on a dirt road that is very bad all the time. We have no street lights, I'm sorry you think I'm selfish not wanting to pay for your transportation. I pay for my own car, taxes, insurance, etc..... for my transportation. How far do you think my $8.00 an hour will go????? I bet your one of those people that want everything given to you. You get your hind end out and work and buy yourself a car and you won't have to depend on us that work and pay for our own way. I watch the AATA buses go empty all day long with no one on them. They are busy at work beginnings and endings. I'm sorry I don't agree with it. Tue, Mar 6, 2012 : 11:02 p.m.
From your description, I don't believe that you live in the City of Ann Arbor. You would not have a well and drain field and you would have garbage pickup. We have a few dirt roads in Ann Arbor that are remnants in township islands and where residents don't want to be assessed for roads, but otherwise they are all paved. I suspect that you live in a township island. They are still scattered around through the city. If you own your house, you should receive a property tax bill from the city (if in the city) or from a township or the county (I'm not quite sure which) otherwise. Tue, Mar 6, 2012 : 8:49 p.m.
Tue, Mar 6, 2012 : 7:59 p.m. I notice that the Liberals always want to spend other people's money. A good example of that is Greexe. They have run out of other people's money so now they want the other countries to help them so they can continue to live without reforms to their spending. I will help a person when they are down but I expect them to help themselves also and not sit back and do nothing. I will not support any more millage increases or renewals. As a property owner I don't believe it is fair that I should be the one paying for our government or for things in the city. Over half of Ann Arbor is non-taxable. So the other half has a free ride. How about getting everyone to pay their share of the cost to run this city and all those pet projects that the Democrats want while closing our fire stations and reducing our police force. And what is the city doing with the money they receive to fix our streets and paint those lines? How about providing the budget on the web or have I missed it. Here here Val! I agree the property owners burden is unfair! The more millages; the more tax and keeps property value down. I to will not vote for new millage or renewals. Let's have an income tax on anybody making a paycheck from Ann Arbor. All the many people coming into town wear and tear our streets, require fire and police protection. They should be paying for some of the cost. Tue, Mar 6, 2012 : 6:54 p.m. Except for four sane council members. The mayor and his council robots are putting all rational reason aside for a make believe mass transit system. What we will get is a Disney World transit system to show off the Land of Oz Emerald Green Belt. The mayor and his cabal are &quot;leading&quot; the county into a boondoggle which will have empty and underutilized buses prancing all over Washtenaw. They are so enamored with this farce that they gave away our majority vote to protect Ann Arbor's interest and money. Additionally refusing to put in any triggers to stop this process. They have no idea what a mass transit system is and what makes it work. Like the most important key ingredient. A high density mass of people to supply a reasonable ridership. The vote profile last night surely will carry through this whole process. Now let's hope us voters are more astute than the council and will vote this down when the time comes. I also hope the same voters start voting in new council members. I thank Steve and Mike on the council for their astuteness and rational thinking. Tue, Mar 6, 2012 : 6:02 p.m.
Just put this thing on the ballot and vote: YES or NO In the end this is how the outcome will be attained. To no one's surprise if this passes, AATA will be back in a year or two crying poverty and threatening to cut service and raise fares if we do not anti up additional funds. We will also be hearing from the burbs about how they are paying large taxes to AATA and receiving disproportionate services. This is one reason SMART is always on bumpy ground. Travel 50 miles South to Toledo, Ohio; this is a huge problem currently being played out with these folks. Ironically, I see this as something we will mirror in the near future as our County &quot;Stakeholders and Partners&quot; decide that maybe this is not the picture Mr.Ford and company painted for them. Tue, Mar 6, 2012 : 5:54 p.m. Expand, expand, expand - AATA is determined to expand their operation, we are going to get the "smart growth" plan shoved down our throat whither we want it or not, just like the new city hall and the idiotic underground parking structure. AATA is out of control, currently AATA's operation is 82% subsidized. I see AATA buses running empty allot. I acknowledge the need and benefits of mass transit for the city of Ann Arbor, however there must be an effort to improve the operating efficiency. AATA consumes money like its water; our great country is in very serious financial trouble with our national debt nearing 15,500,000,000,000 dollars. FISCAL RESPONSIBLE appears to be something AATA has no concept of, the cost associated with "smart growth" is unreasonable. As an example, AATA has paid out nearly 700,000 dollars to consultant "Steer Davies Gleave" to help plan the "smart growth" and proposes another 247,000 for consultant "Generator Group". Obviously money is no object, especially other people's money. Tue, Mar 6, 2012 : 4:52 p.m. I am not opposed to expanding transit services, I do however, have concerns about how the City is going about it. Our Mayor claims there is broad public support for expanding transit services. I wonder though if it is fair for Ann Arbor residents to pay an additional tax, on top of the transit millage Ann Arbor voters currently pay. The majority of council seems to, once again, be in a hurry to push their agenda when in reality we need to tighten up this agreement and provide more protection for the city taxpayers. Is the city council going to act without adequate input from their constituents again? The majority of council tried to push through an ugly building on top of our new underground parking structure, right next to the library, only to realize, after a lot of time and money went into that planning, that a large group of Ann Arbor residents were opposed to this construction and it was halted. The majority of council needs to stop with their personal agenda and truly ask the tax payers early on. Holding a few meetings does not work for the majority of people in Ann Arbor because we have jobs and other interests. We need a mechanism to notify the citizens, and give them a chance to comment, prior to bringing these projects to a second stage discussion at city council. Something as simple as giving concerned citizens the chance to receive emails about upcoming projects might work. Once those are sent out and the recipients have an opportunity to respond we would be able to let our representatives know and they could vote accordingly. We need to put out the message early, and at the lowest cost, so the public is aware and offer comments about the projects. Then we can determine if the city should go ahead with these controversial projects that the council wants to initiate. Tue, Mar 6, 2012 : 7:01 p.m.
My council member in Ward 1 reached out and asked for some input and had a survey (the other just doesn't even reach out except for her own very special interest group). I guess I was a minority in survey respondents otherwise her vote would have been no. Maybe the answer for what you described above is to have a straight city wide ballot vote first to even give permission for the council to consider moving on a project. Tue, Mar 6, 2012 : 4:51 p.m.
4-party agreement for countywide transit authority? Hieftje is the two parties who have thus far agreed. Tue, Mar 6, 2012 : 4:18 p.m. This is wrong, wrong.....thank you Jane Lumm for standing up for &quot;us&quot; the taxpayers. Tue, Mar 6, 2012 : 4:06 p.m.
As a voting citizen of the 2nd Ward I'm proud of our representation on this issue, thanks Jane. For those of you in our other wards I can only ask, are you proud of your representation? If not, cast your vote with more forethought (and remembrance) the next chance you get. Cheers all. Tue, Mar 6, 2012 : 3:47 p.m. I am impressed by Jane Lumm's efforts to do what she is supposed to do, represent her constituents by trying to insert exit strategies to protect A2 residents. I also applaud her efforts to require majority support for Washtenaw County's other local governments, who may soon face a tax increase passed by a majority of voters in two or three communities. Meanwhile, another council member doesn't even want to send a bus out here every now and then. I imagine that is all we will get, a morning bus and an afternoon bus M-F, so no, I do not support this, not without more detail on what western Washtenaw can expect. My concern is we will be taxed for a system that is of little use to western Washtenaw County. Guess this is what being thrown under the bus means. Tue, Mar 6, 2012 : 3:10 p.m.
Why not just deal with the operational reality of the situation ? Not D's v. R's not &quot;who can we help&quot;, &quot;who needs a ride?&quot; or a cool, trendy plan to address &quot;the future of mass transit&quot;. Also let's not take a poll to ask other uninformed people what they think would be fun. Perhaps there is a real objective, analytic analysis out there ? Perhaps a ridership study to indicate the cost effectiveness of the project ? Without facts I am betting on a bunch of empty buses helping a few commuters, we could just pay for cabs and save money. The City has no time for being a model city for folks to play with. Deal with real problems with real analysis. Tue, Mar 6, 2012 : 2:26 p.m.
Again I say, enough of the selfishness. As I stated last week when the $8 an hour wage earner complained about paying for others to ride the bus, it is time to cease the politics of isolation and selfishness, which peaked with the elections of Ronald Reagan to the presidency and like minded politicians to various offices which proceeds to this day. Ann Arbor resident are no better than the above mentioned wage earner when they resent their dollars going to help others save gas money and use public transportation. You are no better than those in Troy and other Oakland County municipalities who complain about Detroit and Wayne County residents using public transportation to bus to work in their cities. I say share the resources, help your fellow man and quit thinking about me, myself and I and quit pitting yourselves against others. Let us work toward a countywide transportation system and eventually a regional transit system we can all be proud of. Thu, Mar 8, 2012 : 7:43 p.m.
Ann Arbor homeowners, including retirees on very limited fixed incomes, are already sharing via a 2 mil AATA tax that subsidizes services for riders, regardless of their needs. It is absolutely incorrect and slanderous to characterize resistance to increasing this sharing as selfish. Many advocates for increased service are doing so in their own self interest without offering to share in the funding needed to expand. Who are the real selfish parties here? Tue, Mar 6, 2012 : 9:57 p.m. It's about common sense not being selfish. hermhawk - Hey I am willing to share a feel good hug and warm cup of highly charged coffee. You interested? Also how would you like to share some of your earnings for my child's education fund? I need a new roof on my house want to share with that need also? I need a new washing machine; like to kick in 10% for a new one? Hey if the city wants to share. Why not get rid of NAP and give that money away by sharing? Tue, Mar 6, 2012 : 4:05 p.m. So how is that vow of poverty working out for you? Tue, Mar 6, 2012 : 2:23 p.m. Thank You Councilperson Lumm for looking out for your voters! Why did Rep. Irwin talk to the city council? He is in the Minority Party at the State House. They should have asked one of the Republican members what their plans were. Tue, Mar 6, 2012 : 2:15 p.m.
Tue, Mar 6, 2012 : 11:05 p.m. Regarding the Financial Task Force results, it should be emphasized that this group is advisory only and is not binding on a future authority. Their budget is basically hypothetical to show how one could afford expanded transit on a half mill. But as they said at their meeting, &quot;this is only a placeholder&quot;. Tue, Mar 6, 2012 : 7:22 p.m.
You can be sure if this county wide TA is in place and as the years roll out in its existence. This will be a conduit to get money for the big picture of &quot;mass transit&quot; system. The new TA will be a target for all special interest groups for their own special needs and ideas. Expect the supporting millage to keep increasing. We also will have a large bureaucracy in place with plenty of overhead like benefits and retirement to fund. All transit systems all over the country are nothing but a money pit because the riders could never pay the true cost by fares. Tue, Mar 6, 2012 : 5:50 p.m.
Tue, Mar 6, 2012 : 2:49 p.m.
Tue, Mar 6, 2012 : 1:51 p.m.
&quot;Mayor John Hieftje and other council members pointed out that by approving the agreement this morning, the City Council has made no final commitments. The city still could opt out in the coming months and essentially halt the countywide expansion, and voters will have the final say before any countywide authority becomes operational and funded.&quot; So then next week we can expect another AA.com &quot;editoral&quot; telling us that we've already gone too far to turn back (the sunk cost fallacy)? Tue, Mar 6, 2012 : 1:42 p.m. Someone explain to me why Ann Arbor has no problem handing out thousands and thousands of dollars for a metal washboard that lights up in front of a city building, but can't find funds for something that would truly benefit the area. A2 people are not the only ones who will pay into the transportation kitty, so stop acting like it's just you, you, you!! Ann Arbor residents will pay triple most of the rest of the county; AND importantly, will receive no reimbursement for the many tens of millions already paid so far for the AATA. All residents of the county should pay the same. That's the way everything else in the county is paid for if open to all residents. Tue, Mar 6, 2012 : 1:39 p.m. The survey referred to in the article that purportedly shows widespread support among county residents for the 4-party transit authority is flawed. First, as mentioned in a previous comment, the demographics for the survey respondents is as follows: Has not heard of TMP ...................... 69% Says heard of TMP but no recall .......14% Heard of TMP and has some recall ...17% No one interviewed for the survey admitted being familiar with the TMP and therefore none of them should have been included in the survey. Also, 39 questions were posed in the survey but responses to only 19 questions were provided in the report. The most egregious omission was for question 9 which reads: &quot;Residents of the City of Ann Arbor and Ypsilanti now pay a property tax to support transit services. No one else in the county pays a transit tax. If voters approve this ballot issue, Ann Arbor homeowners will pay 3 mils, Ypsilanti homeowners 2 mils, and homeowners elsewhere will pay 1 mil in property tax. Does knowing that make you more likely or less likely to vote for this one mil levy or doesn't that make any difference to you?&quot; Is it possible that previously unknowledgeable respondents learned of the details of the millage vote and were uniformly against it? Therefore, the AATA board simply did not report the results. Remember the company that designed and analyzed the survey was hired by the AATA and I am sure knew what was hoped of the results. Knowing the AATA bias for the study could have put pressure on the survey question design and its analysis. Though I do not suspect falsification of data the wording of the interpretation may reflect a subtle if not subconscious effort to please the contractor. And the AATA may have included in its contract the right to decide exactly what elements of the study would be released to the public. Tue, Mar 6, 2012 : 2:54 p.m.
My undergrad marketing research prof. would have failed me if I had created the type of survey questionnaire used by the AATA. Please, anyone from U of M's market research dept. who begs to differ, please let me know. Tue, Mar 6, 2012 : 1:36 p.m. There is no money in the people's pocket or Washington/Lansing. The economy is on the brink again, it won't recover for 5 to 10 years, if ever. Debt has to be dealt with, inflation is breaking loose etc etc. Great rosie pie-in-the sky plan that is now outdated - this is the new normal, get use to it. There's plenty of problems with basic services to be handled now. The plan won't pass by 2014. Tue, Mar 6, 2012 : 1:20 p.m.
4- party transit authority designed to fund Washtenaw Corridor Improvement Authority -- Part 2 The problem presented by the WCIA plans are that traffic congestion will increase with the elimination of one lane of traffic along Washtenaw Avenue when creating either a picturesque median strip or a light rail system. By the way I do not believe that a light rail system will be able to pass under the US 23 viaduct just west of Carpenter Road. The US 23 viaduct has concrete supports in the middle of Washtenaw Avenue that prevents creation of a center lane for the train (or allows 4 lanes of traffic if the rail were laid in an outside lane). In addition as developers are forgiven TIF payments, the city will gain no financial benefits from property development along Washtenaw Avenue. And with speculative building such as Arbor Hills Crossing, business success is not assured. Remember, at one time the builders of the longtime vacant buildings presently at Platt and Washtenaw Avenues expected business success. With the persistent existence of vacant commercial space along Washtenaw Avenue developers should be cautious about introducing additional commercial space. Tue, Mar 6, 2012 : 1:19 p.m.
4- party transit authority designed to fund Washtenaw Corridor Improvement Authority -- Part 1 The 4-party transit agreement is designed primarily as a funding tool for the Washtenaw Corridor Improvement Authority WCIA). I attended several public meetings held by the WCIA in an effort to inform Ann Arbor residents and generate their support. The WCIA board was populated by potential developers, real estate agents, architects and I believe a contractor as well. The primary intention of the WCIA was to beautify Washtenaw Avenue and reduce traffic congestion in order to make development of land along Washtenaw Avenue more attractive. To these ends, the WCIA suggested either a green median strip (trees, bushes, and grass) or a light rail system. The latter would offer a desirable non-vehicle transportation option as well. Unfortunately either effort required funds unavailable at the time. For this reason the WCIA would await creation of a 4-party transit authority which could impose assessments or propose a millage in order to finance these improvements. Furthermore, funds could be used to entice development of properties along Washtenaw Avenue. Already Arbor Hills Crossing is proposed for Platt and Washtenaw Avenue aided by forbearance of fifteen years of TIF payments to repay developers for Brownfield remediation. Tue, Mar 6, 2012 : 1:13 p.m.
Stop voting to spend more money---JUST STOP!!!!! Even though OBAMA is giving away money to states that the US has to borrow from China, the citizens of this community will burdened forever with the tax increase to fund operations of this increased service. JUST STOP!! Looking for people to challenge Chris Taylor &amp; Tony Derezinski, the true mayoral &quot;yes-men&quot; for the democratic primary. Get your own mind--boys and to not be so easily persuaded by biases, self-serving surveys. I hoped that you are brighter than this. Tue, Mar 6, 2012 : 11:46 p.m. This county wide Transit Authority however is a waste of money. Tue, Mar 6, 2012 : 3:35 p.m. Spending money is not always bad, but wasting money is. Look at all the money we waste now: Government subsidizes people to stay home who could work but can't afford to buy a car (earned income tax credit, progressive tax system in general) Rich folks and xenophobes unnecessarily burning fossil fuel (price held artificially low by government intervention) to drive needlessly large and empty truck-like vehicles from places too far from civilization to be practical for anything except agriculture. And getting more tax breaks to pay for their waste. Frugal people would live close to work, stores, low cost public transportation options, or at least drive efficient cars to reduce and share in the overall cost of human existence. Tue, Mar 6, 2012 : 2:38 p.m.
Tue, Mar 6, 2012 : 1:06 p.m.
Oops, meant to say &quot;ONLY 17% surveyed could recall enough to comment on the plan. Tue, Mar 6, 2012 : 12:56 p.m.
Ann Arbor continues to view itself as the center of the universe while the county needs, and has needed for about the last 50 years, some kind of transportation system - high speed, low speed, any speed. When we lived in Ypsilanti, we were a host family for English college students at Eastern and were embarrassed to tell them that, Yes, there is an Ann Arbor, but you can't get there from here. Especially awkward when you know what the English transportation system accomplishes. Tue, Mar 6, 2012 : 3:37 p.m.
Wouldn't it be nice to have a metro/subway like train that ran regularly from the old Depot town station, and another from the Chelsea and Dexter depots? That is what I would like to see, a real commuter train that ran regularly. With lots of free parking near the depots, I think as gas rises this would be popular. Need another track for that I suppose. 17% - of the community surveyed last fall could NOT recall enough about the transit master plan to comment on it. 69% - of those surveyed had not even heard of the transit master plan. 47% - &quot;agreed that &quot;I'd like to expand public transit, but I cannot afford to pay any more taxes&quot; So how do these numbers equate to broad community support?? Tue, Mar 6, 2012 : 7:34 p.m.
Let's hope that these people vote this way when the time comes after they have been fed lies from the Mayor and his supporters. Tue, Mar 6, 2012 : 1:05 p.m.
Tue, Mar 6, 2012 : 12:47 p.m.
Tue, Mar 6, 2012 : 12:34 p.m.
&quot; The plan....appears to have support in the community.&quot; Wow! Now thats a mandate ! Tue, Mar 6, 2012 : 1:47 p.m.
What - the same six people that supported the &quot;pedestrian safetey ordinance&quot;? Tue, Mar 6, 2012 : 12:28 p.m. I know common sense and logic are not traits found in the progressive liberal brain, so I'll try to make it as simple as I can. If you work in Ann Arbor and don't own a car you need to move there. Asking the clowns in Lansing to steal more money from tax payers throughout the state to run empty buses around Washtenaw County is criminal. This country is broke and asking Washington or Lansing to continue to fund your local pet projects is piling more debt on generations yet unborn. Wed, Mar 7, 2012 : 1:43 p.m. But of course, that's not what they're asking (&quot;to run empty buses around Washtenaw&quot;). That trait is called sarcasm and deceit. The comment also reflects a basic kind of ignorance of many issues and details. Tue, Mar 6, 2012 : 11:56 p.m.
Let's look at some figures. Population of Washtenaw is 345,290. Ann arbor 113,934. By this ratio alone 33% of the population is already served by AATA. Ypsilanti city and township is 68,617. With these included approx 50% is covered by AATA. Covering the remaining widely spread population is going to be costly and waste of money. How many of our farmers and their families will be needing a transportation system? Tue, Mar 6, 2012 : 7:27 p.m. I know compromise, openness to alternate viewpoints, and avoiding kneejerk reactions are not traits found in the tea party brain, so I'll try to make it as simple as I can. There are definitely pros and cons to this approach. It's not a slamdunk either way, and requires (IMO) open debate where we assume the good intentions of those who are starting in a different place philosophically but we're all willing to follow the democratic process. Making sweeping generalizations that aren't even factually correct is a good way to annoy those who might actually be persuadable to your point of view. Specifically, our elected politicians are contemplating a local tax through a democratic vote by the citizenry. That has nothing to do with whether or not the &quot;country is broke&quot; and has nothing to do with &quot;asking Washington or Lansing to continue to fund your local pet projects&quot;. Should we have such a local tax? Will it actually net benefit the local economy? Those are all good questions. You ask: &quot;If you work in Ann Arbor and don't own a car you need to move there.&quot; Are you really telling any senior citizen living in the western townships who loses their drivers license due to age or disabled person or child that they have to leave their home and move to Ann Arbor? Personally, I'd like to figure out a way where we can grow in a sustainable, affordable way and meet the needs of the disadvantaged.